I wanted to end this science literacy week book series on a bit of a different note. I’ve covered some amazing books about how to do good science, what it’s like to be a scientist, and some compelling real life science stories. But I’d be remiss in not acknowledging a huge source of science inspiration for a Past Victoria, in the form of nearly endless science fiction and science fantasy novels. I was, and still am, a pretty avid sci fi reader, and am particularly drawn to stories of evolution on other worlds, and where evolution might take us next. 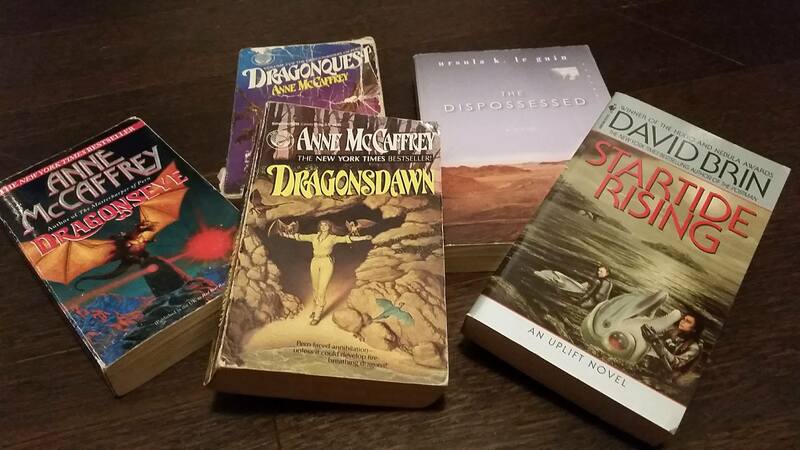 I’ve read pretty much the entire body of work of Anne McCaffrey, who wrote stories across a giant cohesive universe of her creation, but especially stories about a strange planet home to genetically modified dragons that battled deadly spores from a rogue planet. Even better, these stories are set in the future of that world, where the human colonists have forgotten their spacefaring and scientific origins, and are only just now rediscovering their past. What’s not to like about a story of scientific renaissance on an alien planet…and an alien planet with telepathic dragon friends, to boot. About 15 years ago I also discovered the ‘uplift’ stories by David Brin, in which humanity has learned to genetically modify other species on our planet to human-like levels of intelligence. My favourite book in the series, Startide Rising, features large chunks told from the perspective of ‘uplifted’ dolphins, which are both familiar and alien despite their Terran origin – their use of sonar means they experience the world in a fundamentally different manner than humans, making them revered across the galaxy both as pilots and poets. It’s a great thought-experiment for exploring the ramifications of coexisting on a planet with other sentient species, and well worth diving into. Many more science fiction authors have jump-started my imagination over the years – Ursula K. Leguin’s works on anarchism and science, James Tiptree Jr’s absolutely devastating looks at feminism and patriarchy in science fiction settings, Margaret Atwood’s thoughts on genetic modification (I dare you to get the image of ‘chickie nobs’ out of your head once you know what they are) – just a sampling of the ways science fiction pushes us to be creative and to ask new kinds of questions. Science Literacy Week continues over this weekend and I hope you have a chance to participate in some of the many events happening around the country. If you’re in Toronto, come by the ROM on Sunday and say hi to Zuul and I! And don’t forget to take the Complete Dinosaur reader survey before it closes on Monday! ← Science Literacy Week 2017: You can really taste the silt.